Do you ever feel like a project was meant to be? I’m sharing the pattern for this color block crochet basket today, and I must say, finishing a basket feels like the planets aligning. You might have seen a preview on Instagram the other day too! 1. We were (are) drowning in toys and I feel like the guy pushing the rock up the hill in hell, where he pushes it up and it comes crashing down every night. I clean up the toys every night and the kids just drag them out again every morning. I can even clean up during the day, but the baby is right behind me, pulling the toys back out. It’s a losing battle, I suppose, but I wanted some way to harness all the random little pieces. Side note: Why do all kids’ toys have to come in SO MANY PIECES?! Legos, blocks, puzzles. How does anyone expect to keep track of everything? 2. I had my Ikea Kallax shelf in my craft room, but have moved it out to our dining space to use as a bookshelf and a buffet. It had a few extra compartments empty, which were perfect for some baskets. 3. Moving made me really realize how much yarn I have. Holy cow. I had a lot of scraps from when I made a bunch of scarves and hats for a craft fair I attended a few years ago. They were all bulky weight yarn, which is hard to use for lollipop ghosts and baby shoes, so I had to figure out a larger project to work on. This pattern (as forgiving as it is) is for personal use only. Please do not claim this pattern as your own, or sell or distribute it. If you would like to share this pattern, please link to this site and do not repost the pattern on your site. 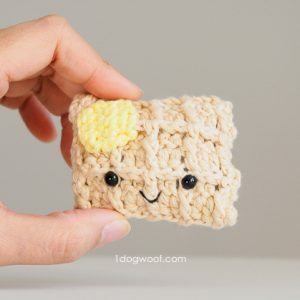 You can sell finished items made from this pattern, but please link back and give credit to One Dog Woof. Thanks! 4 to 5 skeins of bulky weight yarn. I used mainly Lion Brand Wool-Ease Thick and Quick although there were scraps of Bernat Softee Chunky and Loops and Threads Cozy Wool mixed in. 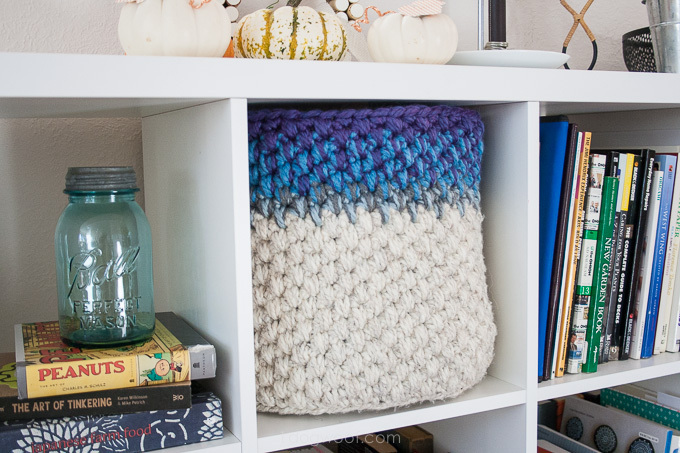 In order to make this basket super thick and sturdy, it was made using two skeins of bulky yarn held together. Round 10. *In the next stitch, work 1 sc in both loops. In the next stitch, insert your hook below the sc from the previous round and complete a single crochet. * Repeat from * around. All of these stitches are technically single crochet stitches, but every other one is double the height because they are worked below the sc of the previous round. Round 11. From here on, just continue the pattern of “1 sc + 1 extra long sc” around and around until you reach the desired height. At some point about 2/3 of the way up to your desired height, you’ll want to change yarn colors, then keep working the same “1 sc + 1 extra long sc” around. The way you change yarn colors will determine your color pattern. I staggered my yarn changes, mostly because they were scraps and were all different lengths. I tied a new color yarn to the old yarn with a square knot because I didn’t want to have to weave in all of these scraps ends, and I just tucked in the little knots as I went along. The green basket was my first attempt. It is 13″ in diameter and I actually put 65 stitches in the final round. It came out a bit floppy. I adjusted the pattern a bit for the blue basket, and only used 63 stitches in the final round, which worked much better at keeping the sides stiff. The final measurements are 13″ in diameter and 13″ high, just right to fit in the Kallax shelf. Will these actually contain all the toys? Maybe. Maybe not. But they’re pretty to look at! Love these! I need so many baskets and bins in my life. These are so homey. Lovely pattern thank you, pinning for that “one day” when I need it! Yes, what is it with toys and bits – especially as kids hit the “mid kid” age everything seems to have a kabillion little pieces, what’s that all about? Thankfully as they get older the little bits decrease, so as their bodies get bigger and they take up more space lounging round the house with their long legged friends, at least the danger of treading of little bits of plastic decreases! And you will be left with beautiful baskets to put your craft supplies in – win win! I’m not ready to think of my babies as loungers with long-legged friends yet. 🙂 Although there are days when it’s definitely frustrating! Walking around the house is like Indiana Jones and the Last Crusade, trying to step on all the correct blocks. Somehow, the kids never hurt themselves though, amazingly. Thank you for such an amazing idea! I am in love with any type of storage idea. 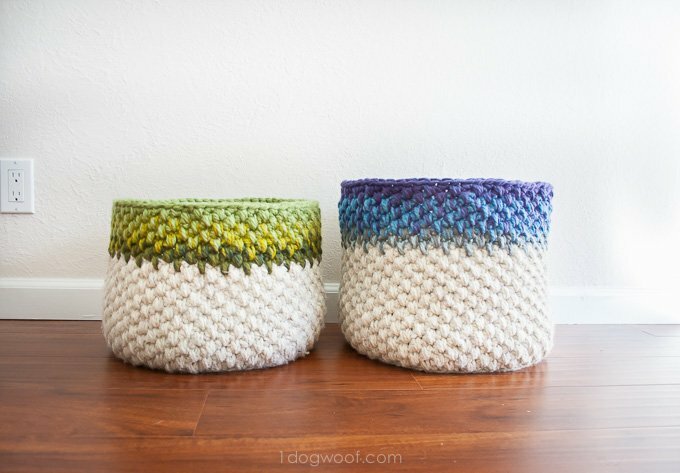 Now I just have to get that bulky yarn into the house without being seen…..lol Thanks again for sharing. Love it! Why did you not join the yarn in the 8th round ??? I made the basket but I still don’t understand the rationale for dropping that last stitch to make it 63 because then I’m working with an odd number. HELP please!!!!! Love these, ChiWei! So pretty–I love the color changes towards the top. How sturdy would you say they are? These has been my one hesitation in making crochet baskets . . . I don’t want them to flop and sag all over the place, but yours look pretty sturdy! Thanks Rachel! 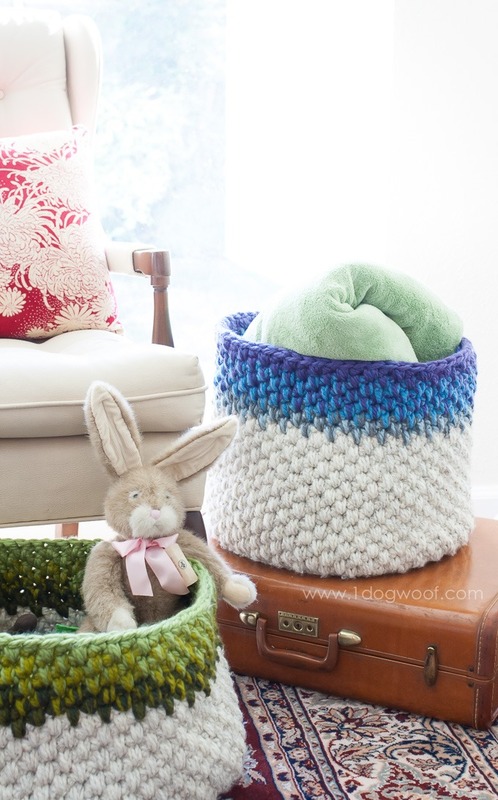 I’ve always hesitated with big baskets too because I felt like they’d just flop over, but I had all this yarn! The green one is definitely floppy, but the blue one stands upright all by itself. The only difference is the number of stitches around. For the green, I increased the 64 to 65, and the for the blue, I decreased from 64 to 63, and it made a huge difference! I may have also crocheted a tighter gauge for the blue one, but I don’t know, my gauge is all over the map. I’ve fill them with heavy toys (cars, wood blocks) and they’re holding up so far. 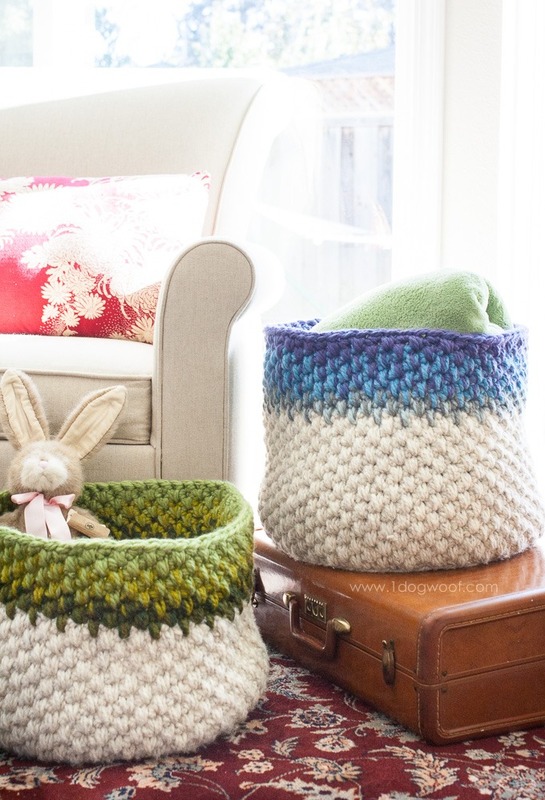 Loved these crochet baskets! I was thinking of building vertical storage units, but these are awesome, I’ll go for this! I saw your basket pattern yesterday and it was the perfect project for the bulky yarn I had been stashing (thought of making a rug with it). Well I started on the base of the basket last night and just finished it today half an hour ago! 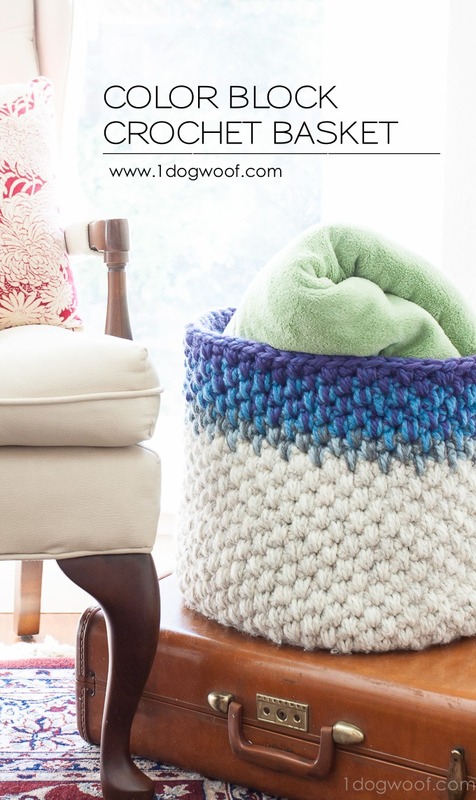 Not bad… Such a great looking basket and so quick to make with the two strands of bulky. I’m going to make three more baskets for three friends who are expecting babies… much more fun than my original plan of a baby blankets. Thank you so much. What would you say the skill level is on something like this? 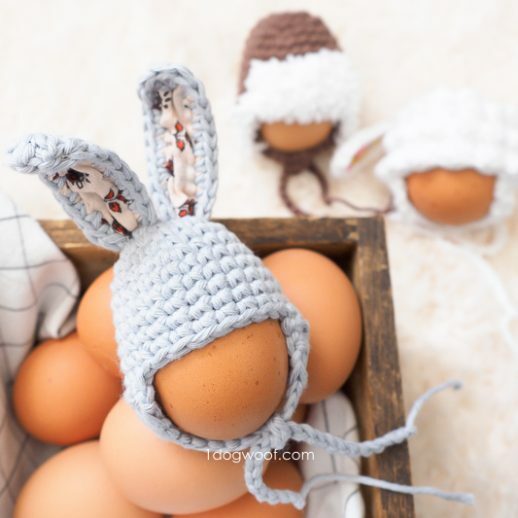 I’ve been thinking about learning to crochet & came across these & love them. Is this something a beginner could tackle after some initial practice? Hey Ashley, I definitely think this is something a beginner can manage. It’s 3 stitches and it just goes round and round and round. Don’t let the size scare you! 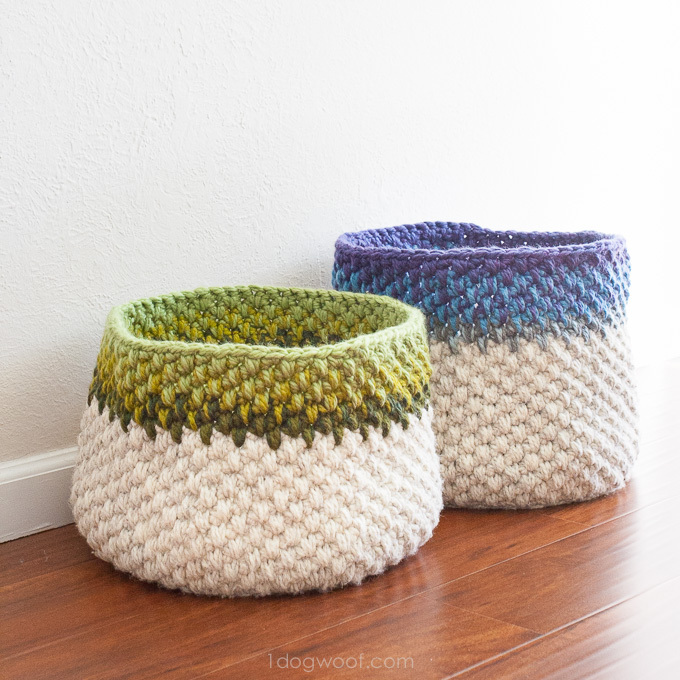 If you want to practice, you can start off learning to crochet in the round in general so that you’re comfortable, since most beginners start by working in rows. But I don’t believe this pattern is complicated at all. Hi ChiWei. I am making the basket and am running into several problems and I don’t know why. I wasn’t sure where to ask so I am replying here. What does the basket look like a few rows going up? Mine is so floppy it doesn’t look like it will end up the same. Is it supposed to stay upright from the beginning going up? Id send a picture but have no way to do that. I think depending on the yarn, it could be floppy, especially at the beginning. My aren’t completely structured either – when I moved, the whole thing packed down itty bitty. I love your baskets and would love to give it a try. Two beginner questions: 1)what is a magic circle and 2) what is an extra long sc/single crochet? I have a post on the magic circle – it’s a way to start crocheting in the round without leaving a hole in the middle. 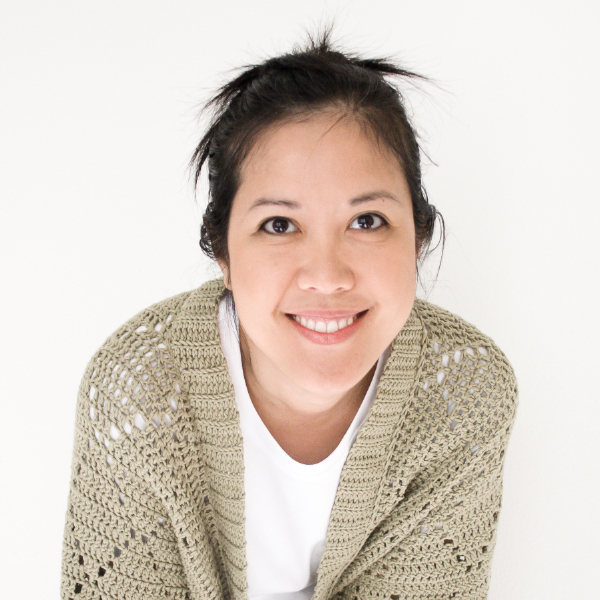 You can go to my Crochet page (top nav bar) to see the tutorials. The extra long single crochet (my own made up term) is to single crochet through both the current row and the previous row, so it’s a single crochet, but twice as big. There is an error message when I try to read the instructions,was really looking forward to making these baskets. Is there something that I am doing wrong? Karen, you’ll probably just need to refresh your cache, as there was an issue last night but it’s been resolved. Thanks for understanding! i love the looks of these. You can never have enough storage. I especially love the picture your little one in the green basket, beautiful. Once I’m done with my current project, this is next on my list. Thank you so much for sharing.. I can’t wait to make one. Thank you Leigh! Yup, my daughter is pretty silly sitting there in that basket. Good luck with your own basket! Hi! Love these. I had a question though on the Round 11 “1 sc + 1 extra long sc” — I just finished Round 10 in which my extra long SC went into the Round 9 SC Row to create the stitch. Since Round 11 does not have an entire row of SC below it- I am unsure of what row to insert my hook into to do the extra long sc? I hope this makes sense. Also for the extra long SC, is there any way you could direct me to a link with photos of how to do this? 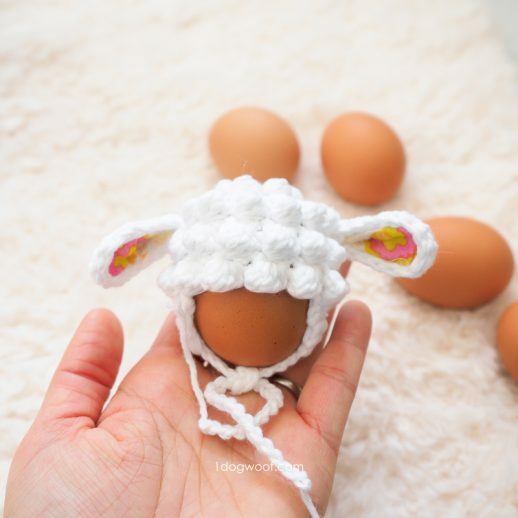 I’m new to crocheting and want to make sure I did it correctly! Thank you! Hi! Okay – I just fixed the Extra Long SC but now I think my basket is inside out. The stitch side that looks like yours is on the inside of mine – Did you flip your basket at the end? Thanks! Hi Sandra, it sounds like you might have figured it out, but in each row, if the stitch below is an extra long SC, then you work a SC into it. If the stitch below is a SC, then you work an extra long SC into it, so you create this alternating pattern. I didn’t flip mine, but you can if you need to. Both sides of in-the-round crochet are beautiful, so do what you need to so you love your basket! I am making this now, the one with the 63 stitches. So far so good with the sturdiness. I’ve used 4 skeins of the oatmeal and am going to finish tonight with the color! Very excited! So great to hear! And it’s awesome when it all comes together, isn’t it? Really looking forward to trying these! Since our children are now past the toy stage (unless guitars and shoes count as toys) my baskets are usually filled with a cat or two! Love having soft, washable baskets I can use for whatever I have lying around. Love these! I tried just winging it before, but my pattern never quite came out right. Can’t wait to try yours! As an extra savings, and a little stiffer basket, I’m making my own t-shirt yarn from old t-shirts. Don’t tell my family, everyone is walking around asking “where’s the old t-shirt of mine?”, sshhhhhhhh. 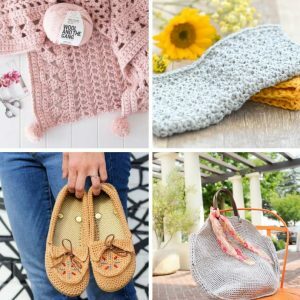 I’m new to knitting and crochet. My great grandmother taught me so I’m no good with reading patterns. That being said I’ve searched the internet for an answer but had no luck. I hope you’ll be able to help me. I have no idea what it means to leave a stitch unworked. From what I can find people say that it means to skip it. But apparently there are several ways to skip it. They say slip stitch, chain however many you need to skip or simply just go into the next hole. So what method are you referring too? And are there 63 stitches after you skip or is it “supposed” to be 63 then you skip and now there’s 62? I’m sorry I’m just really confused and feel silly because no one else seems to have this issue. I guess to leave a stitch unworked is to skip it, as others have said. While working in a round, or a row, you always have to keep track of the right number of stitches, so if you leave one “unworked” or “skipped”, that stitch count still has to be accounted for. Usually, to skip a stitch means that you need to work 1 chain to account for the skipped stitch, and then work into the following stitch. Hope that helps? Go you think these could be made with jute or bulky twine? I love this basket! It is so quick to make. I used the Bernat Blanket yarn (a great yarn to work with and so durable). I made this basket for my 7 month old to put her floor toys in. I don’t have to worry about her tumbling over onto a hard traditional basket. It’s fantastic…thank you so much for sharing this pattern! This basket is not only useful, but with the shade gradations at the top, echo of Southwest basketry and pottery. I’ve just ordered my yards, and will make mine from wheat (which has stray black hair incorporated into it), heather grey, oxford grey, and black. Can’t wait for the yard to arrive! Very excited for this pattern. Thanks! I was thinking the same thing. I did a basket a while back that I used 4 strands of Red heart. I was thinking about doing that. 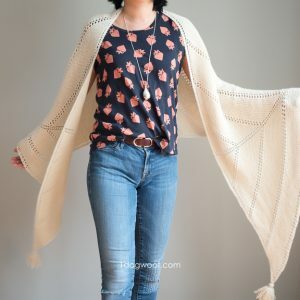 The pattern actually uses a double-strand of super bulky (I know this just ’cause I grabbed the same yarn the pattern uses, and Thick&Quick is only super bulky), so you might need more than 2 strands of a smaller yarn to make it. Otherwise, it might be a little smaller or less sturdy than the original basket. Another commenter said that they had made a smaller version of this basket using a thinner yarn, and it worked well for them, just wasn’t as big. My first-time seen this . I like the app. Thx for the inspiration of your beautiful basket. Mine isn’t as pretty. I made mine into a foot rest/yarn holder. And used up a lot of scrap yarn. Great pattern! Thanks! I didn’t have any bulky yarn, so I used two size 4 yarn weights together. I am at round 10 and its working up nicely! Great way to use the extra year that is in a colour I don’t normally use! Aloha!!! I’ve made several baskets and this pattern is awesome!!! I’ve foubf that using 2 strands of cotton yarn extremely sturdy…. Just wanted to pass that along!! Have an amazing weekend!!! hi, i’m new at this just a few questio. aftrr finish the row10 when you start the sc+long sc when you move to row 11 mean the stich have increase right? when i start to do row 12 the round is curl up like flower .. is this normal? mine at this stage look more like a matt.. flat round shape. did i missed out any steps?? Your project may curl but it’ll even out by the end! I was absolutely inspired by your basket and have started to crochet for the very first time. I’m 6 rows into the side of the basket and can’t see it raising in height, it seems to open up like a huge bowl! Heeelllllppppp!!! Hi Dhivya, make sure to check that you have the same number of stitches in each round as the round before – I’ve had that problem before. Also, sometimes it takes a while for the rows to start looking like height. You can also tighten your stitches if they’re flopping too much. Hope that helps! This pattern is awesome, thank you!!! I’ve already made 2 and I plan to make more:) I use them put my workout stuff in, my weights, yoga block.